Two years ago today, what started out as an innocent cup of coffee with a friend in my library ended up a new epic quest. Toward the end of our visit she mentioned a dream she had the night before about Sir Walter Scott. 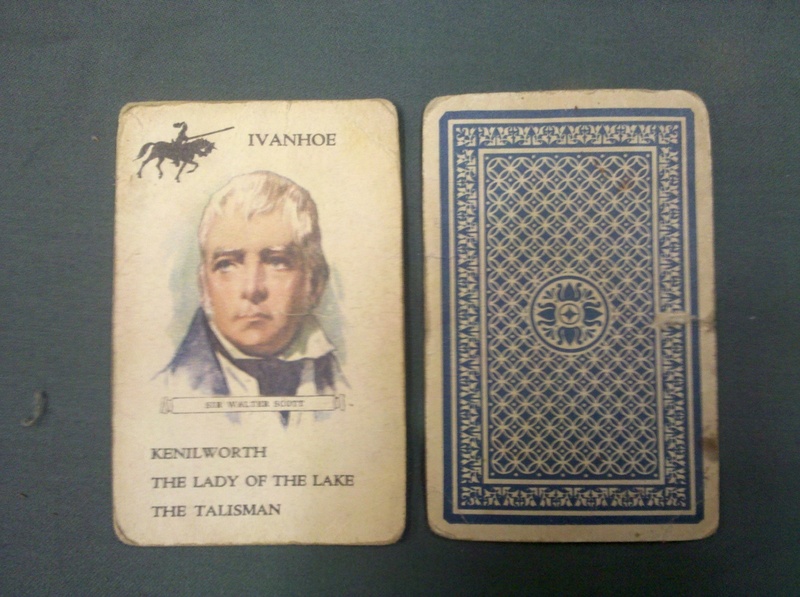 Although we had both heard of him, all I knew was he had written Ivanhoe, thanks to my card game “Authors” I played as a child. I did vaguely remembered the shrine to him in Edinburgh, Scotland. Well when the next step in your life is trying to get your attention you start noticing it everywhere. We did a little research into Sir Walter’s life and put a few more pieces together but then the epic quest began. First a copy of Rob Roy unexpectedly showed up in a waiting room. Then I was researching Thomas Becket and there he was referenced in Ivanhoe. I was doing some final cleaning in the basement and a beautiful old copy of Lady of the Lake was in a small stack of books. The Metropolitan Opera was doing an HD broadcast of Lady of the Lake—not performed in decades. A brochure about his home Abbotsford was uncovered in a box of magazines untouched in 14 years. I was sitting on a wall at the Alhambra in Granada, Spain and my friends and I were discussing the author Washington Irving of Sleepy Hollow fame, who lived on the grounds of the Alhambra. So we googled him and Sir Walter showed up again. He was the great mentor of Washington Irving. 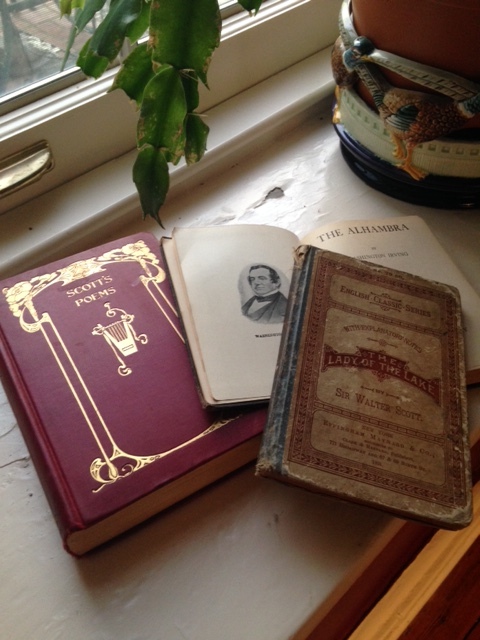 Later I was going through my father’s office and there were beautiful old copies of Scott’s Poems and Irving’s Alhambra right next to each other on the self. So what is going on with Sir Walter? Let’s look a little closer at his life and see why he is still so important. Born in 1771, he survived polio as a toddler which left him with a limp and he used a cane the rest of his life. He was the first author to have international fame in his lifetime and is credited with inventing the historical novel. He used the great storytelling tradition of the Highlands to help bring back the Scottish identity that had been cruelly crushed by the British. His Waverly novels were very popular in Europe and America starting Romanticism and influencing American writers such as Thoreau and Twain. He was also a poet and playwright and his works started the great Romantic era of opera with 25 operas based on his works including Lucia di Lammermoor, one of my favorites. For me the big “aha moment” came when I heard the most important but little know fact about our friend Sir Walter, he translated the Hermetica, the Great Work from Thoth, the Egyptian god of writing and magic. Like so many great authors and scientists, Sir Walter was connected to the deep, underground stream of ancient knowledge that is unknown to the general public. Sir Walter was tapped into the “great wisdom of the ages”. No wonder he was such a game changer. I’m definitely not done with Sir Walter and we will be discussing him again in more detail. I just wanted you to start looking around and see the world beneath superficial life, there are enormous treasures and lots of fun adventures there. Now I’d like to hear if you’ve had Sir Walter show up in your life or some other similar encounter with a great author. –——Today on the 2nd anniversary of the dream, my friend just happens to be at Abbotsford visiting Sir Walter’s library. Hmmmmm, the plot thickens. This entry was posted in Authors, Books, Egypt by theperpetualpilgrim. Bookmark the permalink.